Tested against Japanese sea bass in Tokyo bay, Osaka bay and off shore Hamamatsu, EDONIS has proven its potential beyond any doubt. Thanks to the Megabass original Shaft Balancer System (PAT. 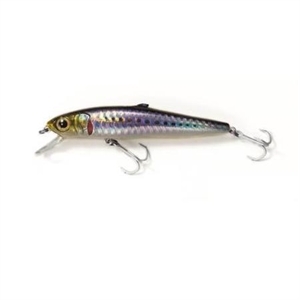 ), EDONIS boasts its unique action unlike other conventional minnow actions; high castability and on & off flashing, all of which are unique to the Shaft Balancer System. And also EDONIS has eliminated the unnatural rattling noise of the Moving Balancer, which sometimes works against the salt-water game fish. Another feature of EDONIS is the Water Intake built in the back, which spits out a bubbly jet stream in order to make EDONIS appear more natural. 'Natural' used to mean of appearance only. No longer. Natural looking finish combined with highly engineered mechanisms for the purpose of overall naturalness, that is EDONIS.